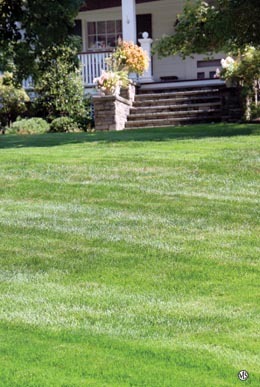 Homeowners aspire toward a beautiful lawn. It is often the centerpiece of a completed landscape, and can serve as a beautiful focal point in a home's overall curb appeal. Typically lawn maintenance is time-consuming and can take a lot of effort on the part of a homeowner. However, by employing a few tips it can be much easier to establish and help a beautiful lawn to endure. 1. Start with the right type of grass. Not all grasses are alike nor compatible with specific climates. Some are drought-tolerant and others are more akin to wet weather situations. There is a particular type of grass that is very low maintenance no matter the climate -- zoysia grass. "Zoysia grass is a great choice for anyone who loves the look of a lush, healthy lawn but doesn't want to be a slave to their lawn," said John Ridgway of Zoysia Farm Nurseries (www.zoysiafarms.com/tca) in Taneytown, Md. "Zoysia grass is a warm season grass that thrives in summer heat and needs far less water during the growing season. It also needs less mowing than most other types of grasses, so it's much less labor intensive." Unlike other grasses, zoysia is sold as individual plant "plugs," which can be integrated right into an existing lawn. They will eventually spread and take over. Early fall is a great time to start a lawn provided it is done 30 days or so before the first hard frost in the area. This establishes the grass before winter and it will get a head start on the next spring/summer growing season. 2. Install an irrigation system. A lawn needs a steady dose of water and ample sunlight to thrive. Some homeowners water too little or water inadvertently pools on the surface of the lawn without reaching the roots. Irrigation systems, particularly drip irrigation systems put water at the roots of landscape plants where they need it most. This helps conserve water by preventing it from evaporating in the sun or watering unnecessary parts of the landscape, such as driveways and sidewalks. There are even kits that install on home downspouts that use rainwater for extra irrigation. 3. Fertilize less frequently. Fertilizer provides the extra nutrients to keep grass green and to encourage the grass to send out rhizomes (underground creeping rootstalks) and stolons (above-ground sprouts), both of which make the grass thicker and more healthy. Follow the instructions on the fertilizer package and don't use too much. A good rule of thumb is to limit fertilizer use to a month before the growing season starts in your area. 4. Mow conservatively. Lawns needn't be scalped, otherwise known as cutting the lawn too short. When the weather has been hot or dry, it may not even need to be cut every week. Thin, closely cut lawns can lead to dying out grass, shallow root systems and eventually a poor-looking lawn. Zoysia grass needs less mowing, so if this is your choice, you may be able to skip some of the most labor-intensive part of lawn maintenance. 5. Enjoy the lawn. Some homeowners want a grass showpiece and fail to ever step foot on the lawn. But with the right type of grass that is thoroughly established and hardy, the lawn will remain durable to kids playing, pets frolicking and simply spending time out in the yard. More information on zoysia grass plugs in the brand name Amazoy zoysia is available at www.zoysiafarms.com/tca. Copyright 2012 Metro Group All Rights Reserved.